Maybe you don’t like Corbyn – but do you really want to vote for THIS? 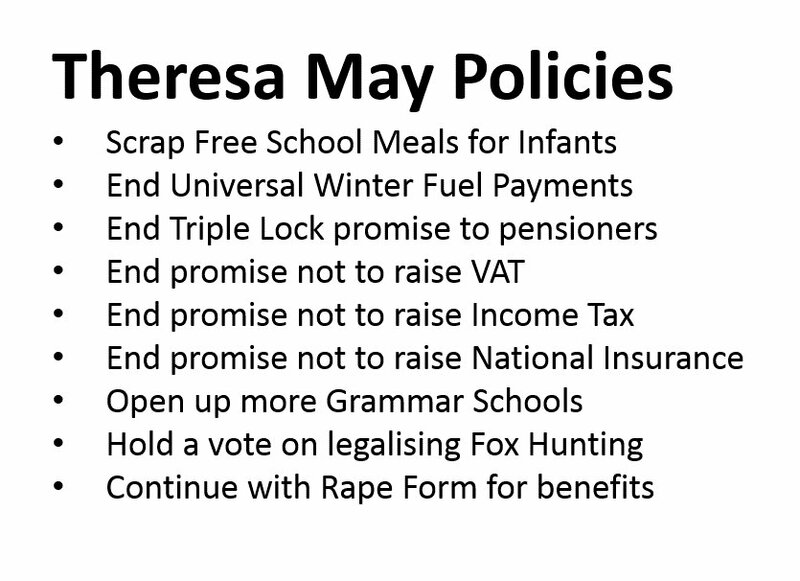 On the eve of the Conservative manifesto launch, these are the policies Theresa May has already trailed. She intends to run the cruelest government since the Dark Ages. It is ideologically-motivated, unjustifiable, homicidal hatred dressed as political policy. The headline policies are scrapping winter fuel payments – marking a clear desire for pensioners to die of hypothermia during the coldest months of the year – and scrapping free school meals for children – meaning most youngsters will go hungry, will be unable to concentrate on their lessons and will end up less well-educated and at a disadvantage in the jobs market. But she has also announced more cruel policies. The first is to end the ‘triple lock’ ensuring that state pensions rise in line with the cost of living. This announces very clearly her intention to persecute the pensioners who are her strongest voter base. 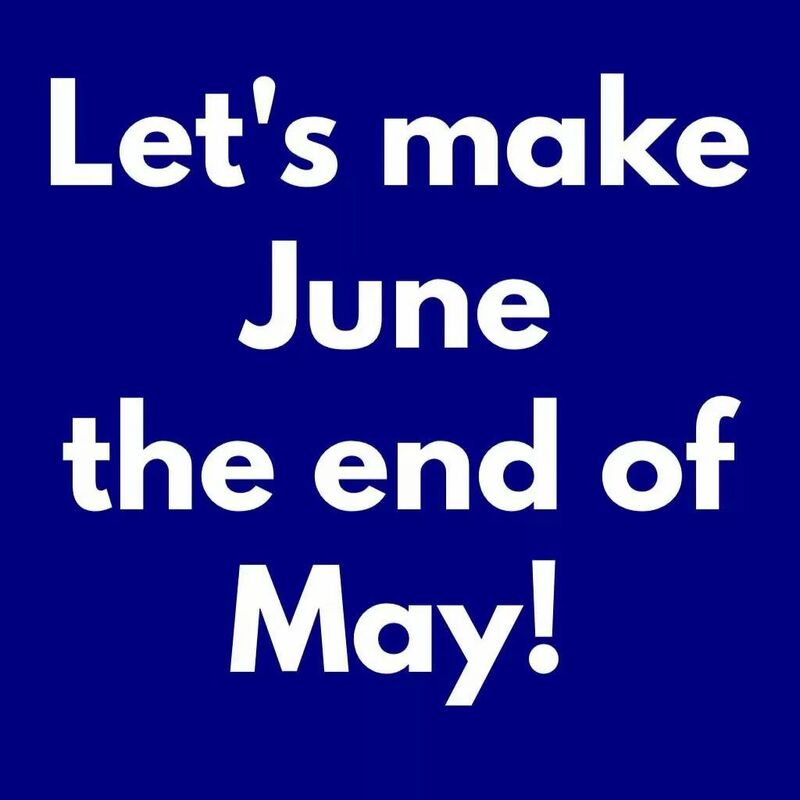 Pensioners – will you still vote for the Conservatives? They want you dead! The second is to end the promise not to increase the amount of tax paid by the general population. This means the rich will not pay more but you will – in order to subsidise even more heavily their fabulous, privileged lifestyles. They are privatising the NHS to make way for a health system you won’t be able to afford. They are making it impossible to claim social security benefits. They have cut police numbers, the fire service, ambulance provision. They have cut grants to local authorities, meaning rubbish and recycling collections are becoming rarities. Wasn’t Labour voted out after a winter in which rubbish was left on the streets? The saddest part of this is that some of the poorest people in the UK will still vote for Theresa May. This Writer heard a woman interviewed on the radio a couple of days ago, saying of Mrs May, “She’s been thrown in at the deep end…” implying that the prime minister was doing very well, all things considered. It seems nobody had told this poor interviewee that Mrs May has been a member of Parliament (for Maidenhead) for more than 20 years, and had admitted wanting to be prime minister at least since she became a member of the then-Conservative shadow cabinet, seven years ago. No doubt the Tories will try to dress up their cruelty as “economic responsibility” or some such drivel. Maybe you don’t like Jeremy Corbyn. But I can’t believe anybody would be gullible enough to vote to harm themselves, as Mrs May clearly expects. Grammar Schools are not necessarily bad, although the rest of her manifesto is pretty vile and I am certainly not voting for her. Thomas, money is being taken from other schools to pay for grammar schools. Schools budgets have already been cut to funnel money into academies. There is an online app that shows how much every school is due to lose. Class sizes are already too high. To Thomas I would say that Grammar Schools are divisive and elitist. Then they’ll get what they deserve, it’s that simple. But we’ll get it too – and we DON’T deserve it! You’re right – WE won’t deserve it. Unfortunately, the idiots who’ll be voting tory for pathetic reasons such as: “That Corbyn – he doesn’t wear a tie!” could well be the ones who inflict more misery on their class. Only when it comes back to bite them on the arse (And it WILL if the tories get in as a result)) will they realise their crass stupidity. I mean, who felt sorry for that soft melt on BBCQT when she bleated that she’d voted tory and now they were taking from her? I just wonder if JC missed a trick not joining the TV debate leaders lineup. I think he would have done very well with his partys many plus point agenda items compared to the others nothing new mantras. His appearing might have put some real credibility behind the developing thread that Mother T is so arrogant that she and her party have got it so buttoned up she does not have to make appearances. Just felt a little let down that JC didn’t appear and lay out his stall that had far better offers than the Cons and the others. All publicity is good publicity and I think Corbyn was very mistaken not to have put his case forward during any debate, whether Mrs May attended or not. Getting the message out their is essential and Labour fluffed it when it came to TV debates. A very major opportunity to big up Labour’s agenda and policies missed. From what I’m seeing today, I don’t think he – or Labour – really needed it.